All-inclusive resorts offer a one-stop shop and one-price option that can be extremely attractive for those families seeking a value-oriented vacation. Here’s a shortlist of the top family-friendly all-inclusive resort companies. All-Inclusive Collection: This company offers a collection Hard Rock all-inclusive resorts that feature a family-friendly vacation experience. These resorts include the Hard Rock Hotel & Casino Punta Cana in the Dominican Republic, and Hard Rock Hotel Cancun, Hard Rock Hotel Riviera Maya and Hard Rock Hotel Vallarta in Mexico. HIT Entertainment's Little Big Club, a dedicated kids facility, is featured at each All Inclusive Hard Rock Hotel. In addition, Hard Rock Hotel Riviera Maya, the newest addition to the All Inclusive Collection, offers two resorts within the resort, an adults-only and family-friendly section. Barceló Hotels & Resorts: This company has all-inclusive properties in Costa Rica, the Dominican Republic and Mexico that can accommodate all clients, from value-oriented guests to upscale travelers seeking luxury accommodations to families. In Punta Cana, Barceló Bávaro Beach Resort includes the family-friendly Barceló Bávaro Palace Deluxe. In Costa Rica, the company offers the Barceló Langosta Beach, Barceló San Jose Palacio, Playa Tambor and Barceló Tambor Beach. In Dominican Republic, it features Barceló Bávaro Beach, Barceló Bávaro Palace Deluxe, Barceló Capella Beach, Barceló Dominican Beach, Barceló Puerto Plata, Barceló Punta Cana, and Barceló Santo Domingo. In Mexico, it offers Barceló Costa Cancun, Barceló Cuernavaca Ejecutivo, Barceló Huatulco Beach, Barceló Ixtapa Beach, Barceló Karmina Palace Deluxe, Barceló Los Cabos Palace Deluxe, Barceló Maya Beach, Barceló Maya Caribe, Barceló Maya Colonial, Barceló Maya Palace Deluxe, Barceló Maya Tropical, Barceló Puerto Vallarta and Barceló Tucancun Beach. In Nicaragua, it has the Barceló Montelimar Beach. Beaches Resorts: This is Sandals’ all-inclusive resort product for everyone, including families. The Beaches brand includes the company’s largest resort, Beaches Turks & Caicos, in the entire chain. Guests of Beaches resorts in Jamaica and Turks & Caicos get properties with some of the finest beaches of the Caribbean, deluxe accommodations, premium-brand wine and spirits, nightly entertainment, land and water sports. From the Beaches Resorts Caribbean Adventure with Sesame Street to the Xbox Play Lounge, and candlelight dinners to Red Lane spa treatments, there is truly something for everyone at every age. Resorts include Beaches Negril and Beaches Ocho Rios in Jamaica, and Beaches Turks & Caicos, Providenciales. Club Med: Each Club Med property provides an all-inclusive experience complete with accommodations, food, facilities, games and entertainment. In addition to those in the Americas, Club Med has 60 properties in Europe, including mountain resorts in the Alps; Asia, including the new Club Med Guilin, China; and Africa. For the Americas, family-friendly properties include Club Med Club Med Columbus Isle in the Bahamas; Club Med Itaparica, Club Med Rio das Pedras and Club Med Trancoso in Brazil; Club Med Punta Cana in Dominican Republic; Club Med Sandpiper Bay in Florida; Club Med La Caravelle in Guadeloupe; Club Med Buccaneer's Creek in Martinique; and Club Med Cancun Yucatan and Club Med Ixtapa Pacific in Mexico. Dreams Resorts & Spas: Part of the AMResorts collection of all-inclusive resorts, this brand provides family-friendly programs and activities at a variety of properties in Costa Rica, Dominican Republic and Mexico. In Costa Rica, the brand features Dreams Las Mareas Costa Rica; in Dominican Republic, it offers Dreams La Romana, Dreams Palm Beach and Dreams Punta Cana; in Mexico, it offers: Dreams Cancun, Dreams Huatulco, Dreams Los Cabos, Dreams Puerto Aventuras, Dreams Puerto Vallarta, Dreams Riviera Cancun, Dreams Tulum, Dreams Villamagna. Grand Pineapple Beach Resorts: Grand Pineapple, part of the Sandals resort family, offers affordable all-inclusive resorts on Antigua and in Negril, Jamaica. These kid-friendly beach resorts aim to provide value-oriented family vacations in the Caribbean. Resorts include the Grand Pineapple Beach Antigua and the Grand Pineapple Beach Negril. Holiday Inn Sunspree Resort: This family-friendly resort in Montego Bay, Jamaica, includes accommodations, three meals per day, snacks, local-brand cocktails and use of non-motorized watersports equipment. In addition, children ages 12 and under stay, play and eat free when accompanied by a paying adult (maximum two children per room), and have access to special resort programs and clubs. The GoldenSpree program for seniors is also included. Hilton Hotels & Resorts: This well-known hotel and resort chain opened its first family-friendly all-inclusive resort in Mexico in 2012. Hilton Puerto Vallarta Resort features 259 luxury rooms and suites, an elegant architectural design and breathtaking views of the mountains and the Banderas Bay. Hyatt Hotels & Resorts: The first two Hyatt-branded all-inclusive resorts made their debut late last year after the Royal Cancún and Barceló Los Cabos were rebranded as Hyatt Zilara Cancun and Hyatt Ziva Los Cabos, respectively. Hyatt Ziva Rose Hall, Jamaica is set to open later this year. The Hyatt Ziva brand focuses specifically on family vacations, while Hyatt Zilara is for couples only. Family friendly properties include the Hyatt Ziva Los Cabos in Mexico and, when it opens, the Hyatt Ziva Rose Hall in Jamaica. 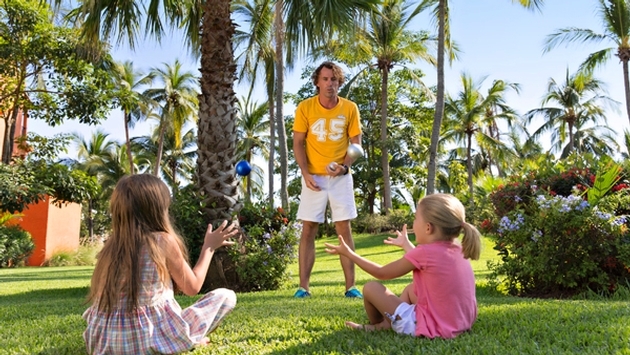 Iberostar: Not all Iberostar properties are family friendly, but the vast majority do cater to family groups. The company operates 10 properties in Mexico, three resorts in Jamaica and six in the Dominican Republic. In the Dominican Republic, family-friendly properties include Iberostar Bávaro Suites, Iberostar Costa Dorada, Iberostar Dominicana, Iberostar Hacienda Dominicus and Iberostar Punta Cana; in Jamaica, properties include Iberostar Rose Hall Beach and Iberostar Rose Hall Suites; and in Mexico, the company features Iberostar Cancun, Iberostar Cozumel, Iberostar Paraíso Beach, Iberostar Paraíso Del Mar, Iberostar Paraíso Lindo, Iberostar Paraíso Maya, Iberostar Playa Mita, Iberostar Quetzal and Iberostar Tucan. Karisma Hotels & Resorts: This chain of “gourmet inclusive” resorts operates two family-friendly brands in Mexico and Jamaica, Azul Hotels and Generations Resorts. Azul Hotels by Karisma specializes in family vacations, with three properties in Riviera Maya and one in Jamaica that feature family suites, kids clubs, infant equipment, child toys and free family reunion coordination services. Generations Resorts by Karisma features all-suite accommodations with unlimited nanny and butler service. Azul resorts in Mexico include Azul Beach Hotel, Azul Fives Hotel, Azul Sensatori Mexico, Azul Villa Carola and Azul Villa Esmeralda, as well as Azul Sensatori Jamaica (Negril) in Jamaica. Generations resorts include Generations Maroma and Generations Riviera Maya in Mexico. Meliá Hotels International: This company offers all-inclusive resort properties for families, couples and upscale travelers. These five-star, all-inclusive properties that provide romantic experiences for couples and vacations for families in sophisticated environments. In the Dominican Republic, the company offers the Paradisus Palma Real and Paradisus Punta Cana. In Mexico, it features the ME Cancun, Paradisus Cancun, Paradisus Playa del Carmen La Esmeralda and Paradisus Playa del Carmen La Perla. Now Resorts & Spas: This relatively new all-inclusive brand, also part of the AMResorts collection, features a rapidly growing group of family-friendly properties. In the Dominican Republic, these include Now Emerald Cap Cana, Now Larimar Punta Cana, Now Onyx Punta Cana and Now Pearl Cap Can. In Mexico, the company features the Now Amber Vallarta, Now Jade Riviera Cancun and Now Sapphire Riviera Cancun. Oasis Hotels & Resorts: This company operates all-inclusive resorts in Cancun and the Riviera Maya, each offering something for everyone, including families. The Grand Oasis Viva/Oasis Viva in Cancun’s Hotel Zone is an all-oceanview resort comprising two hotels. The 165-room Grand Oasis Viva features contemporary décor and offers an infinity pool and VIP lounge. Resorts include Grand Oasis Cancun, Oasis Cancun, Grand Oasis Palm, Oasis Palm, Grand Oasis Viva, Oasis Sens, Oasis Smart, Grand Oasis Tulum, Oasis Tulum. Occidental Hotels & Resorts: Occidental Hotels & Resorts offer all-inclusive vacations emphasizing enjoyment and relaxation. Clients have unlimited access to a wide array of amenities and activities, including fine à la carte dining and premium beverages. Family-friendly properties include the Occidental Grand Aruba; Occidental El Embajador and Occidental Grand Punta Cana in Dominican Republic; Allegro, Allegro Cozumel, Occidental Grand Cozumel, Occidental Grand Nuevo Vallarta and Occidental Grand Xcaret in Mexico. Occidental Grand Xcaret is adjacent to the family-friendly Xcaret Park and Dolphinarium. Palace Resorts: This company offers seven family-friendly all-inclusive resorts in Mexico in Cancun, Riviera Maya, Cozumel and Isla Mujeres. The resorts emphasize deluxe amenities, facilities and services, including in-room double Jacuzzis, fine cuisine, 24-hour room service, premium beverages, world-class entertainment by top entertainers. Resorts include Beach Palace (Cancun), Cozumel Palace, Isla Mujeres Palace, Resort (Cancun), Moon Palace Golf & Spa Resort (Cancun), Playacar Palace (Playa del Carmen). Palladium Hotels & Resorts: This company offers all-inclusive upscale resorts that are ideal for families, couples, newlyweds and honeymooners. In Brazil, the company offers Grand Palladium Imbassaí Resort & Spa, Bahia; in Dominican Republic, it features Grand Palladium Bávaro Resort & Spa, Grand Palladium Palace Resort Spa & Casino, Grand Palladium Punta Cana Resort & Spa, and The Royal Suites Turquesa by Palladium; in Jamaica, it has the Grand Palladium Jamaica Resort & Spa and The Grand Palladium Lady Hamilton Resort & Spa; and in Mexico, it offers Grand Palladium Colonial Resort & Spa, Grand Palladium Kantenah Resort & Spa, Grand Palladium Riviera Resort & Spa, Grand Palladium Vallarta Resort & Spa, Grand Palladium White Sand Resort & Spa, The Royal Suites Punta de Mita by Palladium and The Royal Suites Yucatan by Palladium. Real Resorts: Real Resorts manages four all-inclusive beachfront properties in Mexico, two of which are family friendly. All four properties feature great service and gourmet dining plus large guest-suites, an array of fine-dining options and personalized service. Family friendly resorts include the Gran Caribe Real in Cancun and the Gran Port Real in Playa del Carmen. Riu Hotels & Resorts: Riu Hotels & Resorts offers all-inclusive accommodations for virtually every type of traveler, including families. In Aruba, the company features the Hotel Riu Palace Aruba; in Bahamas, it offers the Hotel Riu Palace Paradise Island; and in Costa Rica, it has the Hotel Riu Guanacaste and Hotel Riu Palace Costa Rica. In the Dominican Republic, Riu features the ClubHotel Riu Bambu, Hotel Riu Naiboa, Hotel Riu Palace Bávaro, Hotel Riu Palace Macao and Hotel Riu Palace Punta Cana. In Jamaica, it offers the ClubHotel Riu Negril, ClubHotel Riu Ocho Rios, Hotel Riu Palace Jamaica, Hotel Riu Montego Bay and Hotel Riu Palace Tropical Bay. Finally, in Mexico, Riu has the Club Hotel Riu Tequila, Hotel Riu Cancun, Hotel Riu Caribe, Hotel Riu Emerald Bay, Hotel Riu Lupita, Hotel Riu Palace Cabo San Lucas, Hotel Riu Palace Las Americas, Hotel Riu Palace Mexico, Hotel Riu Palace Peninsula, Hotel Riu Palace Riviera Maya, Hotel Riu Playacar, Hotel Riu Plaza Guadalajara, Hotel Riu Santa Fe and Hotel Riu Yucatan. Sandos Hotels & Resorts: This family-friendly all-inclusive resort group now has portfolio of seven properties and growing, including four resorts in Mexico and three in Spain. These include two boutique all-inclusive resorts in Mexico: the Sandos Cancun Luxury Experience, offering a sophisticated culinary program, and Sandos Finisterra Los Cabos, on the tip of Baja, which is also Sandos’ fourth and newest Mexico property. The 957-room Sandos Caracol Eco Resort & Spa on Riviera Maya is a sustainable all-inclusive, offering an entirely eco- and culture-focused experience centered on Xcalacoco, the Mayan archaeological site. Sandos Playacar Beach Resort & Spa on Riviera Maya with 840 rooms is geared for couples, families and beachgoers. Sunscape Resorts & Spas: This family-friendly all-inclusive resort group, also part of the AMResorts collection, features Sunscape Curaçao and Sunscape Dorado Pacifico Ixtapa in Mexico. SuperClubs: SuperClubs offers one family-friendly Breezes “super-inclusive” resort in the Bahamas. 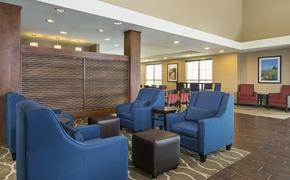 The resort welcomes singles, couples, groups of friends and families. Editor's note: A version of this story appeared in the March edition of Agent@Home Magazine.